Progressive hard rock band Rush took over the Mohegan Sun arena last Thursday night (May 9th) as part of the second leg of their "Clockwork Angels" tour. The band was recently inducted into the Rock 'n' Roll Hall of Fame last month, but made no mention of it during the show, but that's the type of band they are. They've built their legion of followers through their mystical albums and outstanding live shows without the need of flash and fame. The three-hour performance was broken up into two sets, with the first set lasting just over an hour. It began with bassist/keyboardist/singer Geddy Lee playing the first notes, on the keyboard, of one of their concert staples "Subdivisions." Rush snuck in some rare gems like the rarely performed "Grand Designs" and "Territories" from their 1985 album, "Power Windows." Sandwiched between these two songs was the crowd pleaser "Limelight" as guitarist Alex Lifeson was just warming up for his blazing solo later on during "The Analog Kid." Drummer Neil Peart performed the first of his three drum solos at the conclusion of the funky instrumental "Where's My Thing?" The first set closed with a hard-driving version of "Far Cry" from their 2007 album, "Snakes & Arrows," complete with pyrotechnics. 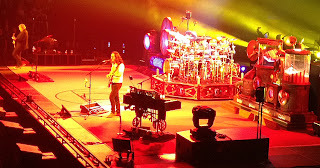 After a ten-minute break, Rush returned to the stage, along with a seven-piece string section to perform their brand-new album, "Clockwork Angels" almost in its entirety. Some of the highlights was the heavy, thick sounding "Carnies," the new fan favorite "Headlong Flight" (which included the second of Peart's amazing drum solos) and "The Garden." The audience just watched in awe, as if they were each searching for a deeper meaning with these new songs. The set continue with Rush diving back into their extensive catalog, performing "Dreamline" and the classic instrumental "YYZ." Neil Peart's third drum solo, "The Percusser" had him incorporating different sounds to his outlandish drum kit to create a truly unique experience. The second set closed with the entire audience clapping in unison during the chorus of "The Spirit Of Radio." Rush returned to the stage for the encore, beginning with the tradition of tossing out a couple dozen t-shirts into the crowd. They they picked up their instruments to perform the band's biggest selling single and most well-known song, "Tom Sawyer." The night concluded with the trio performing parts I, II and VII of their 20-minute concept song, "2112." Now having seen Rush four times over the last decade, I can honestly say that they only get better with age. This is such an awesome overview. Thanks for sharing your great writing, really love the amount of detail that you put into it! We saw the Baltimore show a few nights earlier from this event; it was equally as fun and almost hard to believe they can put on just as great of a show as I saw nearly 25 years ago.